DELTA — Ex-militants cutting across Ogun, Lagos, Ondo and other ‘Niger Delta States’ led by one Gen. Ogailo Iborry, have lamented their neglect by the government after been deceived into surrendering their arms and been coerced into accepting to benefit from the Presidential Amnesty Programme. 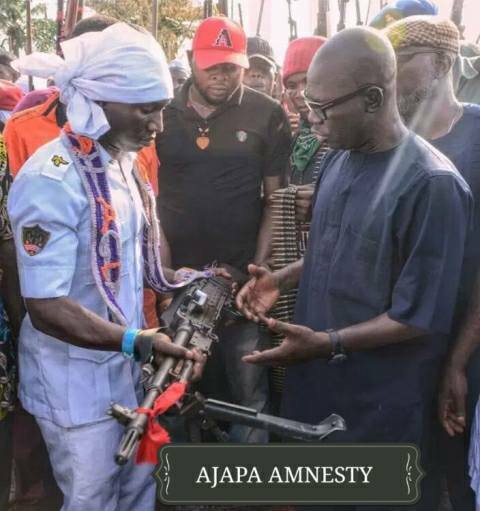 According to the ex-militants, “the federal government, through the Deputy Governor of Ondo State Agboola Ajayi, who was the Chairman of the State Amnesty Committee, together with representatives of the Delta State Government, Commanding Officer of the Nigerian Navy Forward Operation Base, Igbokoda, Navy Captain Usman Yahaya were all witnesses of the handover ceremony last year. “The promises made by the federal government included enlisting them into the Amnesty programme, provision of a College of Education, bridge, water system toilets, network facilities, and pipe borne water to the community, payment of stipends and release of over two hundred young men who are citizens of this great nation as well as pipeline and oil facilities surveillance jobs. Furthermore, the ex-militants stated that “instead of fulfilling their promises, the government deployed soldiers to the region to wreck havoc. This has led to an outcry amongst the people and these men are now being forced to return to arms. “We state categorically that the deputy governor of Ondo State and Chairman of the State Amnesty Committee, Mr. Agboola Ajayi has since the willing submission of arms not made direct contact with any of us or even picked any of our calls to him. The aggrieved ex-militants asked: “By neglecting to fulfil their promise, are the federal and state governments portraying to us that they prefer unrest to the peace presently being experienced in the Niger Delta region and the nation at large? “Are they saying that the unrest is better for the economic and political development of the country considering that the country is at the brink of an election year? The petitioners added: “We dropped our arms because of our faith in the Gen. Muhammadu Buhari led administration. We also use this opportunity to declare our continued trust that the President being a man of integrity will ensure that the promises made to us are kept. “We call on their Excellencies Governors Akinwunmi Ambode of Lagos State, Oluwarotimi Akeredolu of Ondo State, Ibikunle Amosun of Ogun State, Seriake Henry Dickson of Bayelsa State and Dr. Ifeanyi Arthur Okowa of Delta State as well as their deputies and all other well meaning governors in the country to partner with the federal government to facilitate the fulfillment of the above promises in order to avoid the dire consequences that may be the resultant effect of a return to arms in the region.